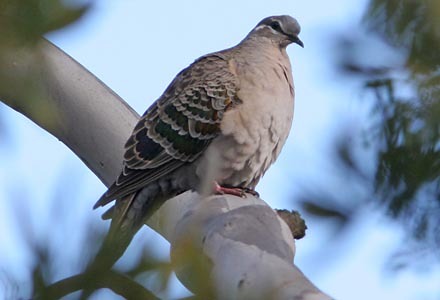 Pigeons and doves form a large, easily-recognized family of worldwide distribution. Some thrive in huge dense flocks, as with the peripatetic Flock Bronzewing in the interior of Australia (above). These recall the flocks of millions of Passenger Pigeon Ectopistes migratorius that once darkened the skies of eastern North America, but are now extinct due to over-hunting and habitat destruction. Others are mostly solitary denizen of remote forests, such as the critically endangered Pink Pigeon of Mauritius (left), now the subject of a captive breeding and reintroduction project. Mauritius was once the home of the famed Dodo, a giant flightless pigeon that was extinct by 1681. Some columbids are among the most gorgeous birds in the world, including Orange Dove of Fiji, beautifully photographed (right) by Murray Lord. It is in the genus Ptilinopus — the fruit-doves — to be discussed below. Others are common and widespread open country species. Two examples follow. First is a young Mourning Dove from North America, interrupted while bathing in a shallow river. It can be aged as a juvenal-plumaged bird by the crisp white edges the upperwing coverts. Below that is a common and widespread Old World species: Laughing Dove. It ranges from India and the Middle East down throughout open-country Africa. This adult is sun-bathing. In his monograph on the Columbidae, Goodwin (1970, 1983) recognized five subfamilies of pigeons and doves. Baptista et al. (1997) used these to organize their Handbook of the Birds of the World account. Modern molecular techniques were not then available, but much of Goodwin's work has survived rather well into the modern era of DNA sequencing. Two of Goodwin's five subfamilies were single-species groups that have now proven to be subsumed within larger groups, leaving essentially three subfamilies. The most recent review of the family with DNA techniques is Pereira et al. (2007), and they found three major clades. Two of these more or less match Goodwin — a "Columbinae" group of "typical pigeons and doves" and a huge set of most of the tropical pigeons — but the third is unexpected. It is a small clade consists of 16 species in 4 genera of New World ground-doves. Most of these are Neotropical but a few breed in the southern United States. Another — Ruddy Ground-Dove —is a widespread Central American species that is a vagrant to the U.S. This shot of Ruddy Ground-Dove (right) is of a vagrant in Death Valley, California. The current evidence appears to indicate that the ancestor of these ground-doves was the earliest columbid to evolve, at least in the New World. The "Columbinae" group — Pereira et al. (2007) declined to formally revise the phylogeny of this family until additional data were available — has been studied a lot. Johnson et al. (2001) undertook a detailed molecular review of the genera Columba and Streptopelia. They found that the New World "Columba" were not closely related to the Old World Columba, and thus assigned a new genus to the New World pigeons: Patagioenas. The widespread Band-tailed Pigeon (below left) is in that new genus. It is found in forests from western North America all the way down the spine of Central America to the Andes. This leaves Columba for Old World species such as Hill Pigeon of eastern Asia (below right). The most widespread and abundant Columba pigeon in the world is Rock Pigeon (left). In the wild its range included much of India, the Middle East, and Europe. It became a common human commensal far in the past — used as a racing pigeon, a carrier pigeon, a homing pigeon — and is now abundant in major cities of the world. It has been bred in captivity for eons and many human-customized varieties exist. Birds similar to the original wild stock show glittering iridescence of pink and green on the neck (left). Competitive homing pigeons have remarkable navigational and flight abilities, and can average 1000 km/day at 50 km/hr. In 1986 a pigeon called "Charlie" crossed the Atlantic from Guernsey, British Channel Islands, to Brazil, some 7588 km in distance (Baptista et al. 1997). 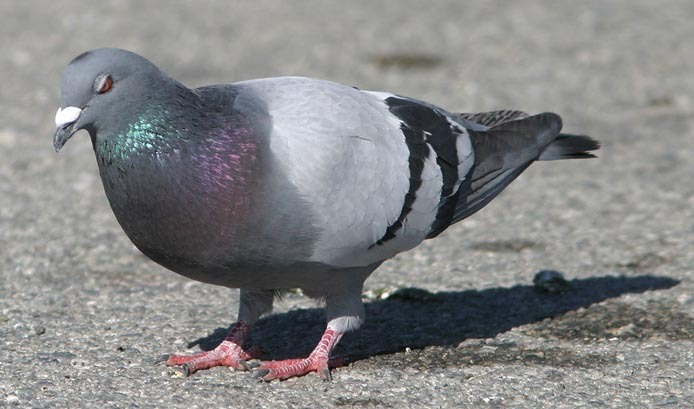 For decades the abundant city columbid was called "Rock Dove;" recently it was officially renamed Rock Pigeon, consistent with the rest of the Columba pigeons. So some ask "what is the difference between a pigeon and a dove?" There really is no scientific answer. Rather, the smaller and paler columbids tend to be called "doves" while the larger, heavier, and darker columbids are traditionally called "pigeons." The common Rock Pigeon is intermediate in size, and can qualify as either a dove or a pigeon. In the tropics, as we shall see, the small colorful ones are often called "fruit-doves" while the large, heavy ones may be called "imperial-pigeons" or "mountain-pigeons." Another columbid whose range has dramatically spread around the world is Eurasian Collared-Dove (right) — the species finally reached my backyard in pine woodland of California. One of the "collared-doves" or "turtle-doves" in genus Streptopelia in the Old World — known for the prominent neck markings — this species' range has expanded dramatically. Original native to India, it expanded into Turkey and the Balkans in the 16th century. Finding an open niche in towns and cultivated land, it spread throughout Europe in the 1940s and 1950s. In Britain, 4 birds in 1955 had become 19,000 by 1964. A dove-breeder apparently released 50 birds in the Bahamas in the early 1970s, and they were discovered in Florida in the lat 1980s, apparently having immigrated from the Bahamas. They then spread throughout much of the Caribbean while, at the same time, began colonizing the southern U.S.; all summarized in Romagosa & McEneary (1999). They have now occurred throughout the U.S. and southern Canada. 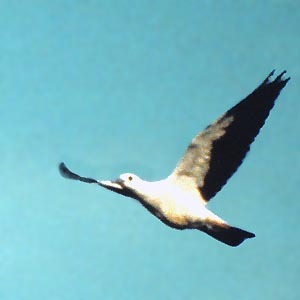 Birds were known to be released in southern California in 1992. From various release points, these have spread statewide. The first on the Monterey Peninsula was in 2000. This one reached my backyard in Pacific Grove in June 2010. A resident population now breeds in my town. Johnson et al. (2001) reviewed the relationships of the 16 species of Streptopelia, and found that there were 3 evolutionary clades. 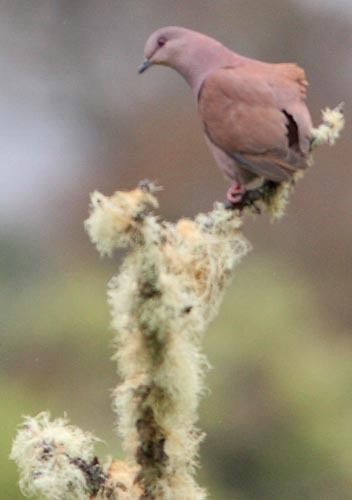 They found that most were in a group of African and Asian collared and/or turtle-doves, but that the endangered Pink Pigeon Nesoenas mayeri of Mauritius was in another clade, along with Madagascar Turtle-Dove S. picturata. Laughing Dove was in the third clade along with Spotted Dove S. chinensis of eastern Eurasia. There are two ways of looking at this evidence, and that is just now being sorted out. One can lump then all — including Pink Pigeon — in one large Streptopelia assemblage, or one can assign Madagascar Turtle-Dove to Nesoenas (with Pink Pigeon), and then put Laughing and Spotted Doves in genus Spilopelia. The latter two species lack the "excitement cry" that is so typical of the "usual" Streptopelia doves (Baptista et al. 1997). I prefer that arrangement. The Old World tropics has three genera of cuckoo-doves — mostly forest dwelling species — that range from southeast Asia into Australasia. The Macropygia set are brown and long-tailed, like Slender-billed Cuckoo-dove (left). This is a female of the heavily neck-barred race albicapilla from Sulawesi. Three species in Reinwardtoena are large and mostly gray and white, while two species of Turacoena are quite glossy-black. 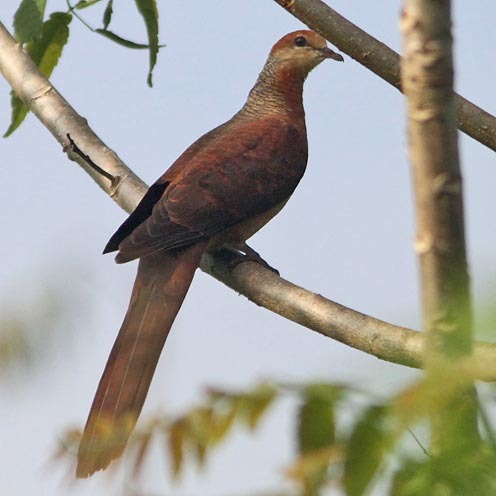 An example is White-faced Cuckoo-dove of Sulawesi (below), sometimes called "Sulawesi Black-pigeon." In the New World, genus Patagioenas includes a variety of forest species in the Neotropics, including Ruddy Pigeon (near right) which generally prefers montane cloud forests (look at the moss on the branch it has chosen . . .). 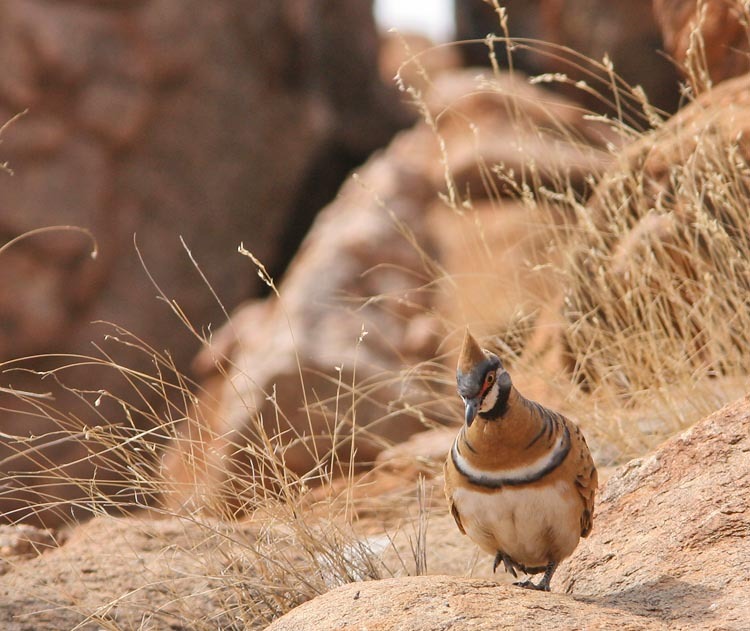 Other genera in this group include Zenaida — open-country generalists like Mourning Dove — and ground-dwellings such as the Leptotila doves and Geotrygon quail-doves. The Leptotila doves are comprised of 11 species that prefer to forage on the forest floor, where they eat seeds, fallen fruit, and insects. The entire set are quite similar in appearance. White-tipped Dove (far right in a nice shot by Greg W. Lasley) ranges the farthest north. 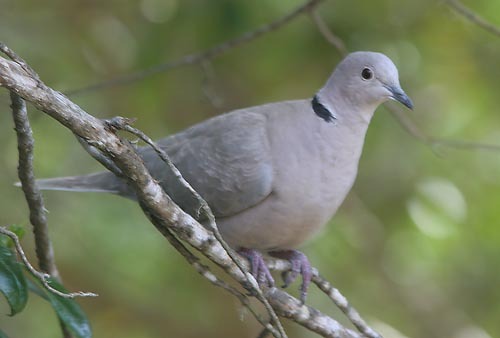 Several endangered species are among this genus, including the critically endangered Grenada Dove L. wellsi, known only from a single small woodland on the small Caribbean island of Grenada. The New World quail-doves are real skulkers, and it often seems that any encountered with one of them is just pure luck. There is a need to create new genera, as Geotrygon, currently in use for almost all of the quail-doves, is paraphyletic (Johnson & Weckstein 2011). Although the doves and pigeons within the first two major groups of columbids are interesting, there are times when they can sometimes seem, well, mostly quite "ordinary." It is when one hits the Old World tropics that pigeons really start to amaze. There are huge spectacular pigeons such as the 3 species of crowned-pigeons in New Guinea [genus Goura]. Adults sport impressive crest feathers; Southern Crowned-Pigeon (left, beautifully photographed by Simon Woolley) has rich maroon underparts. These mostly ground-dwelling pigeons prove to rather close relatives of the now-extinct Dodo (right: 1638 sketch by Cornelius Saftleven; skeleton at the Natural History Museum, London). These huge pigeons — with 9 inch bills and weighing up to 50 lbs — were once thought to be within a separate family "Raphinidae," but DNA evidence proves them embedded within the Columbidae. The nearest living relative is the monotypic Nicobar Pigeon Caloenas nicobarica, and they are sister to the crowned-pigeons; Shapiro et al. (2002). 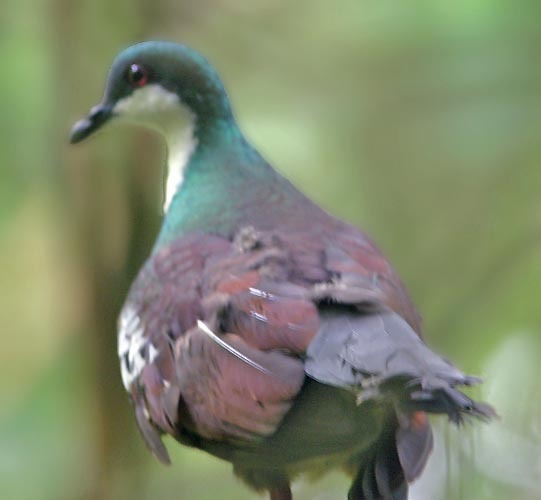 The monotypic Tooth-billed Pigeon Didunculus strigirostris of Samoa and the large Pheasant Pigeon Otidiphaps nobilis of lowland and foothill forests in New Guinea are also within the same set of related ground-dwellers. Among the large "Clade C" in Pereira et al. (2007) are three other large subclades with many species of Old World pigeons. One of these has just discussed, with Dodo and crowned-pigeons. Each subclade might be considered a subfamily — rather similar to Goodwin's subfamilies. The one that Goodwin did not anticipate, and is thus newly considered a distinctive set of columbids, contains a number of genera from southeast Asia to Australasia, and most of them are ground-dwellers. Sixteen species were once assigned to genus Gallicolumba, but a recent phylogeny shows that genus to be polyphyletic as then constituted; Jønsson et al. (2011). Nine ground-doves from New Guinea and the Solomons that are distributed north to oceanic islands as far as Micronesia are now assigned to genus Alopecoenas. Of necessity, this colonization required over-ocean flights of up to 1100 km, which seems quite amazing. 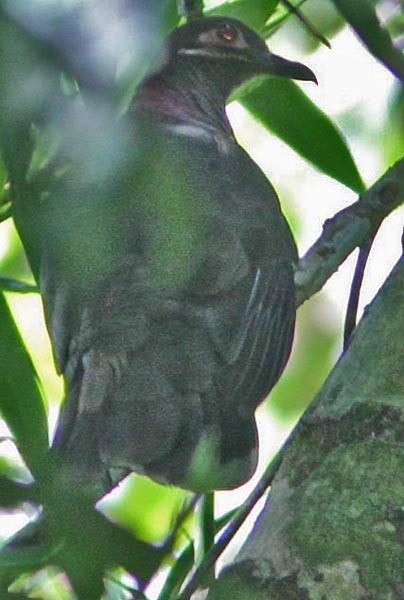 Some of these are now considered endangered, including Caroline Ground-Dove (below), which occurs only on Chuuk (Truk) and Pohnpei in the eastern Caroline Islands. Among the ground-doves in the remaining Gallicolumba are five bleeding-heart pigeons in the Philippines. Each of them is very shy and elusive; three are rated as critically endangered. During a visit to Mindoro Island, and while staying at the warden's home in a prison adjacent to remnant forest, prisoners brought us a snared Mindoro Bleeding-Heart early in the morning. A leg was injured (photo below) but it seemed to recuperate with rest and water, and later we trekked well into the forest to release it. It flew well on release and, in a brief stop before disappearing for good, seem to perch well. So this shot of Mindoro Bleeding-Heart was taken in the wild (right). Australia has a very impressive set of pigeons and doves, most of them within the same set of columbids as the Old World ground-doves. 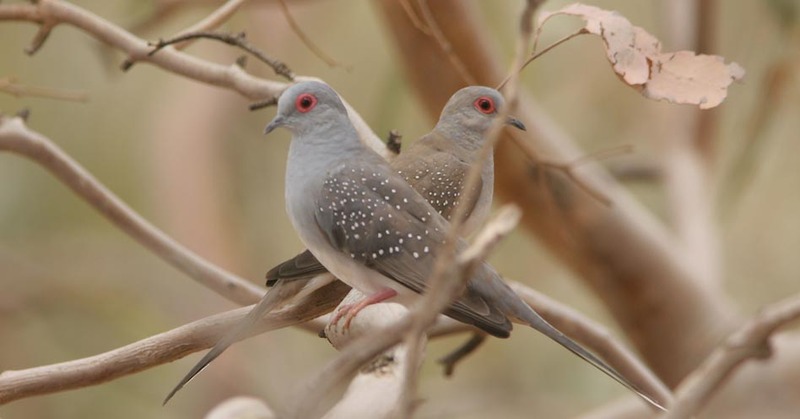 Diamond Dove (pair above) is dainty, delicate, and delightful. Spinifex Pigeon (right) is as dramatic as the red-rock habitat in which it lives. Common Bronzewing (below left) prefers open woodlands, such as eucalypt woods, but is also at home in mulga or mallee. Wonga Pigeon (below right) prefers the understory of dense rainforest. Africa has genera in this groups as well. The lovely and dramatic Namaqua Dove is a bird of thornscrub veldt in eastern and southern Africa. This is a female (left) from Kenya. The black-faced male (below) is shown at a Kalahari waterhole that also has a visiting Ring-necked Dove, sometimes called "Cape Turtle-Dove." Yet another small radiation is composed of the green pigeons (genus Treron) and assorted offshoots. Green-pigeons occur in both African and southern Asia. 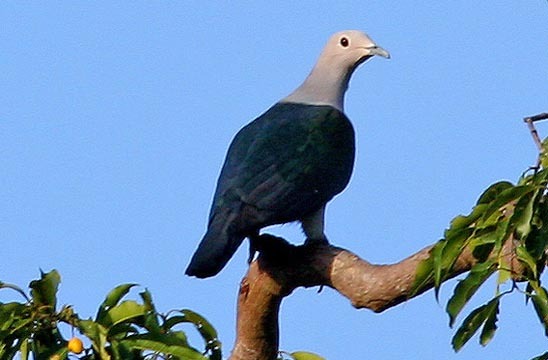 Small evolutionary offshoots include the blue-pigeons of the Indian Ocean and the "brown-doves" of the Philippines. Seychelles Blue-Pigeon (left) is one of three Alectroenas pigeons: one each on Madagascar, the Comoros, and the Seychelles. This species has bare red orbital skin with warty projections over the forehead, giving a dramatic appearance at close range. It evolved from the fruit-dove line. Amethyst Dove (right) is a Philippine endemic that inhabits the forest interior and can be quite difficult to see. 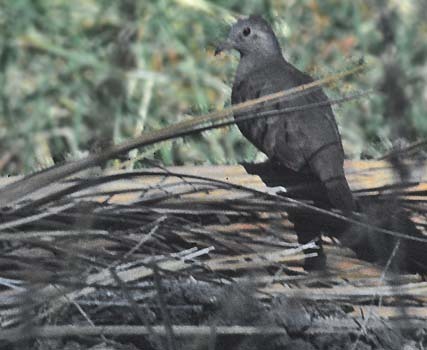 It is one of three species of Phapitreron "brown-doves." Oddly, they are currently assigned to the same subclade as the Namaqua Dove of African savanna; Pereira et al. (2007). Finally, a third of the world's pigeons are in an evolutionary subclade composed of fruit-doves (genus Ptilinopus), imperial-pigeons (genus Ducula), and related small genera, some of which have been recently merged into Ptilinopus; Gibb & Penny (2010). Essentially 100 species are in this set of tropical, arboreal frugivores. Some are very colorful; many are difficult to see well in the forest interior or in the canopy. It took flash photography to obtain a shot of Red-eared Fruit-Dove (above) in the pre-dawn darkness in montane Sulawesi. It also took flash to observe this nesting White-bibbed Fruit-Dove in the Wandammen Mts. of New Guinea (right, a fine shot by Will Betz). White-bibbed Fruit-Dove has five subspecies, some with all-white "bibs" and other, like this one of race bellus, with a bright yellow crescent within the "bib." There are about 46 species named "fruit-doves," although other species, like the Orange Dove at the top of this web page, are also fruit-doves. Then there are ~35 species called "imperial-pigeons"in the genus Ducula. These are very large arboreal pigeons of the Old World tropics. Most combine gray, white, green, or rufous in their plumage. They tend to sit high in the canopy and are difficult to spot until they fly. The majority of them occur on islands from the Philippines through Indonesia to New Guinea. Spectacled Imperial-Pigeon (above left) is a common species in the Moluccas. Pied Imperial-Pigeon (above right) is one of three rather similar mostly white pigeons stretching from tropical southeast Asia to northern Australia. There is also a range of variation within species of fruit-doves and imperial-pigeons, and some may eventually prove to be separate species. Rather little is known about most of these tropical pigeons. Green Imperial-Pigeon (both photos below), for example, ranges from India to eastern Indonesia, and has 13 named subspecies (Baptista et al., 1997). Among these are a wide variety of plumage differences, and maybe some vocal ones has well. Nominate D. aenea aenea (below left in a nice shot by Blake Matheson) ranges from southeast Asia to the Philippines. It has a gray head and underparts and a green mantle, rump, and tail. The race on Sulawesi, D. a. paulina (below right), differs in having a prominent rufous nape. Photos: The dense flight of Flock Bronzewing Psophia crepitans was along the Birdsville Track, South Australia, 0n 20 Nov 2009. 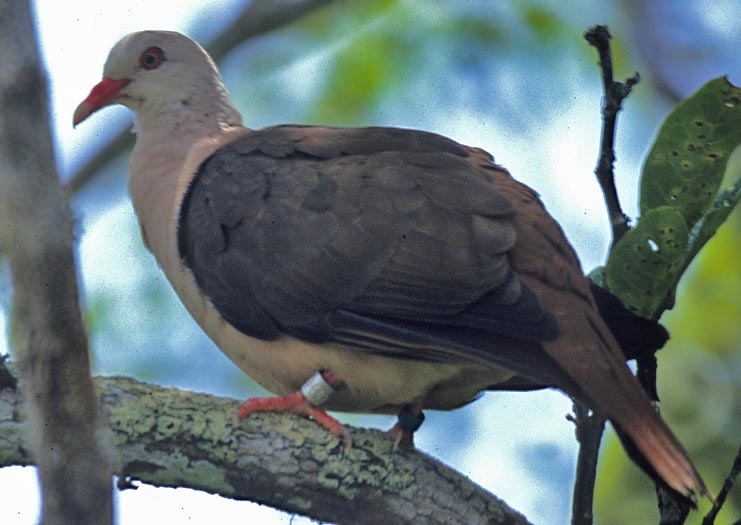 The Pink Pigeon Nesoenas mayeri was on Mauritius in Dec 1992. 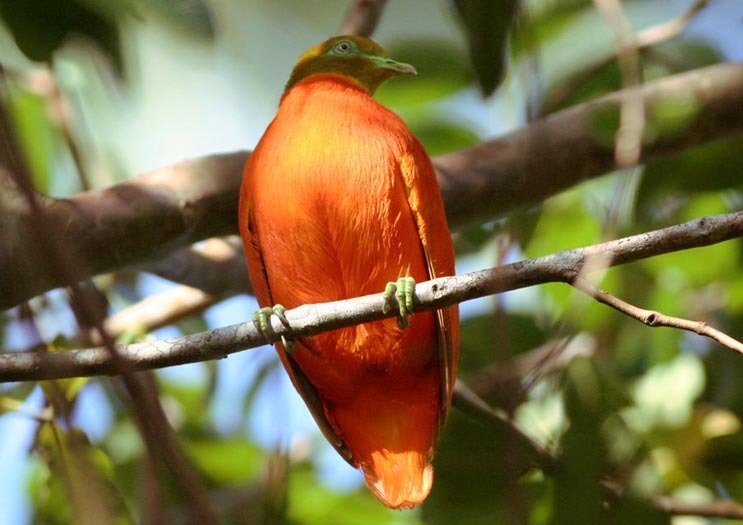 Murray Lord photographed the Orange Dove Ptilinopus victor on Fiji in March 2008. 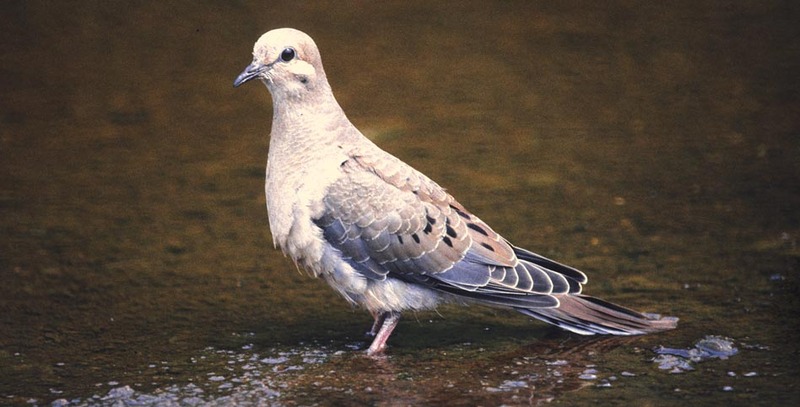 The juv Mourning Dove Zenaida macrura was bathing in the Carmel River, California, on 9 Sep 1991. The sunbathing Laughing Dove Streptopelia senegalensis was at Ma'agan Michael, Israel, on 18 Oct 1981. The Ruddy Ground-Dove Columbina talpacoti was at Furnace Creek, Death Valley NP, CA, USA, on 23 Oct 1988. The Band-tailed Pigeon Patagioenas fasciata was in my yard at Pacific Grove, Monterey Co., CA, USA, on 18 Feb 2006. 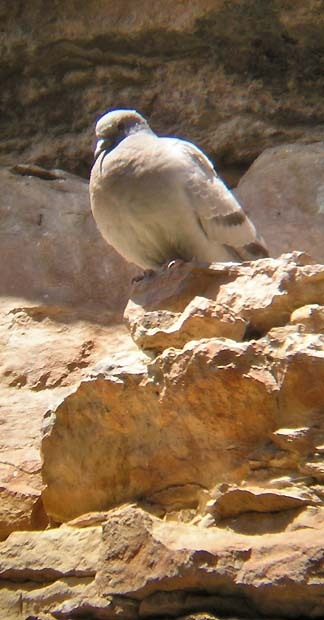 The Hill Pigeon Columba rupestris was at Bao Qo, Xining, China, on 16 June 2004. The non-native Rock Pigeon Columba livia was at Seaside, Monterey Co., Calif., USA, on 18 Feb 2005. The non-native Eurasian Collared-Dove Streptopelia decaocto was at my Pacific Grove yard on 9 June 2010. The Slender-billed Cuckoo-Dove Macropygia amboinensis and the White-faced Cuckoo-Dove Reinwardtoena manadensis were at Tambon, Sulawesi, on 3 Oct 2011. 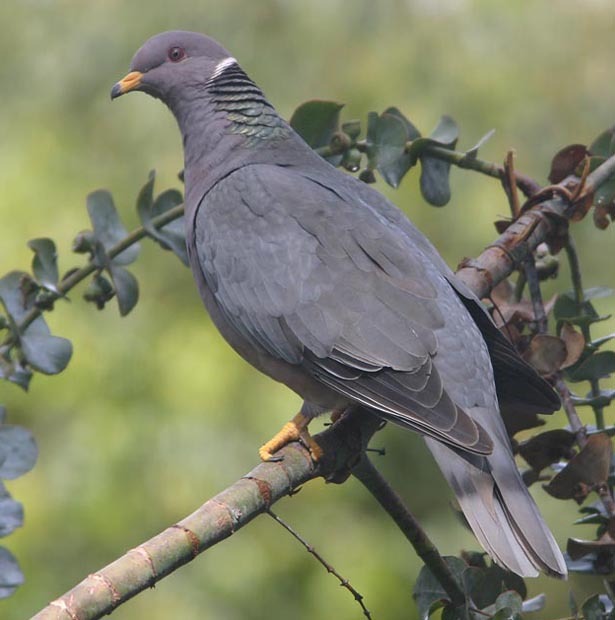 The Ruddy Pigeon Patagioenas subvinacea was at Savegre, Costa Rica, on 22 Dec 2007. 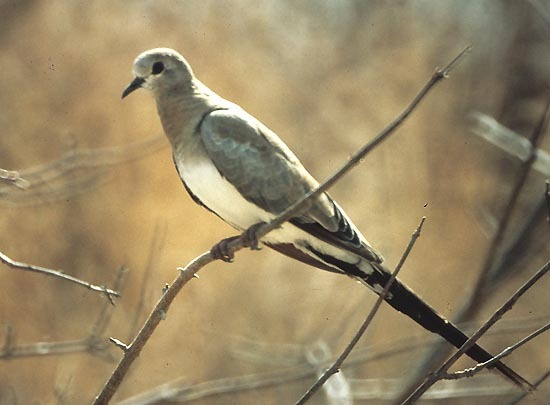 Greg W. Lasley photographed the White-tipped Dove Leptotila verreauxi at San Isidro, Texas, USA, on 2 Sep 1995. Simon Woolley & Julia Casson obtained the photo of Southern Crowned-Pigeon Goura sheepmakeri at Kiunga, Papua New Guinea, in July 2009. The sketch and skeleton of the Dodo Raphus cucullatus are from Wikipedia. The Caroline Ground-Dove Alopecoenas kubaryi was was on Moen I., Chuuk, Micronesia, on 30 Aug 1978. The two shots of Mindoro Bleeding-Heart Gallicolumba platenae were taken at Sablayan, Mindoro, Philippines, on 8 Dec 2005. The Diamond Dove Geopelia cuneata was along the Birdsville Track, South Australia, on 21 Nov 2009. The Spinifex Pigeon Geophaps plumifera was at Ormiston Pound, Northern Territories, Australia, on 17 Aug 2008. The Common Bronzewing Phaps chalcoptera was near Hobart, Tasmania, on 21 Aug 2008. 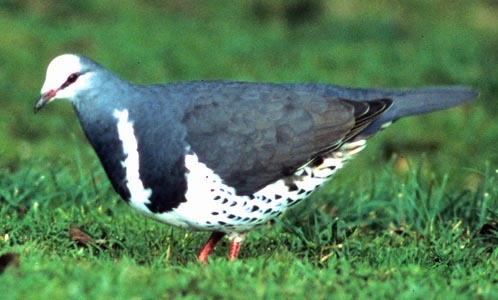 The Wonga Pigeon Leucosarcia melanoleuca was in Lamington NP, Queensland, Australia, in Nov 1983. The female Namaqua Dove Oena capensis was at Samburu NP, Kenya, in Nov 1981, and the male Namaqua Dove with Ring-necked Dove Streptopelia capicola were at Kalahari NP, South Africa, in July 2005. 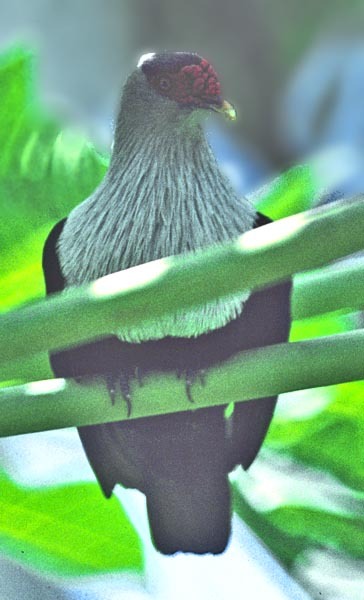 The Seychelles Blue-Pigeon Alectroenas pulcherrima was on Fregate I., the Seychelles, on 11 Nov 1992. The Amethyst Dove Phapiteron amethystina was at Rajah Sikatuna NP, Bohol, Philippines, in Dec 2005. The Red-eared Fruit-Dove Ptilinopus fischeri as along the Anaso track, Lore Lindu NP, Sulawesi, Indonesia, on 28 Sep 2011. Will Betz photographed the nesting White-bibbed Fruit-Dove Ptilinopus rivoli bellus in the Wandammen Mts., Irian Jaya, Indonesia, in Oct 1997. 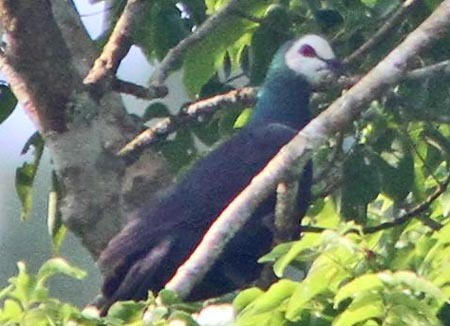 The Spectacled Imperial-Pigeon Ducula perspicillata was at Foli, Halmahera, Indonesia, in Oct 2011. The Pied Imperial-Pigeon Ducula bicolor was at Palau Rambut, off Java, Indonesia, on 25 Aug 1988. Blake Matheson took the image of the nominate Green Imperial-Pigeon Ducula aenea on Palawan, Philippines, in Dec 2005. 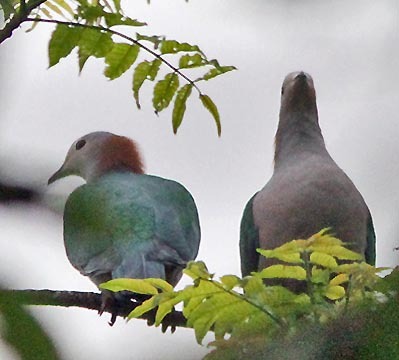 The pair of paulina Green Imperial-Pigeon were at Tambun, Sulawesi, Indonesia, on 6 Oct 2001. All photos © Don Roberson, except those attributed to Murray Lord, Simon Woolley & Julia Casson, Will Betz, Blake Matheson, and Greg W. Lasley, who retain those copyrights, used with permission; all rights reserved. Derek Goodwin. 1970, 1983 (3d ed). Pigeons and Doves of the World. British Museum; 3d ed. published by Cornell Univ. Press, Ithaca, N.Y.
Goodwin's family summary was the major reference for doves and pigeons through 3 editions in the late 20th century. It had only a few color plates of selected species but had many black-and-white line drawings throughout. It is now quite dated in its information — particularly about the ecology and life-history of remote tropical species — but did have a worldwide perspective for its time. Now, much more is known about most columbids, and newer publications, like that in the Handbook of the Birds of the World series (Baptista et al. 1997) have replaced it was the primary reference for the family. Yet, the introduction remains a very reliable overview, and Goodwin's taxonomic theories — based on what was known of plumage and life-history at the time — have proven to be quite prescient. Many of his innovations in phylogeny have been supported by recent molecular analysis. So, unlike other older tomes, this classic remains useful despite its age. [My review is based on the 3d edition]. There is another, newer, family book on the Columbidae that I have not seen: Gibb, D., E. Barners, and J. Cox. 2001. Pigeons and doves: a guide to the pigeons and doves of the world. Pica Press, Sussex, U.K.
Baptista, L.F., P.W. Trail, and H.M. Horblit. 1997. Family Columbidae (Pigeons & Doves), pp. 60 –245 in Handbook of the Birds of the World (del Hoyo, J., A. Elliott & J. Sargatal, eds). Vol. 4. Lynx Edicions, Barcelona, Spain. Gibb, G.D., and D. Penny. 2010. Two aspects along the continuum of pigeon evolution: a South-Pacific radiation and the relationship of pigeons within Neoaves. Molec. Phylog. Evol. 56: 698-706. Goodwin, D. 1983. Pigeons and Doves of the World. 3d ed. Cornell Univ. Press, Ithaca, N.Y.
Johnson, K.P., S. de Kort, K. Dinwoodey, A.C. Mateman, C.T. Cate, C.M. Lessells, and D.H. Clayton. A molecular phylogeny of the dove genera Streptopelia and Columba. Auk 118: 874-887. Johnson, K.P., and J.D. Weckstein. 2011. The Central American land bridge as an engine of diversification in New World doves. J. Biogeography 38: 1069-1076. Jønsson, K.A., M. Irestedt, R.C.K. Bowie, L. Christidis, and J. Fjeldså. 2011. Systematics and biogeography of Indo-Pacific ground-doves. Molec. Phylog. Evol. Pereira, S.L., K.P. Johnson, D.H. Clayton, and A.J. Baker. 2007. Mitochondrial and nuclear DNA sequences support a cretaceous origin of Columbiformes and a dispersal-driven radiation in the Paleogene. Syst. Biol. 56: 656-672. Rheindt, F.E., J.A. Eaton, and F. Verbelen. 2011. 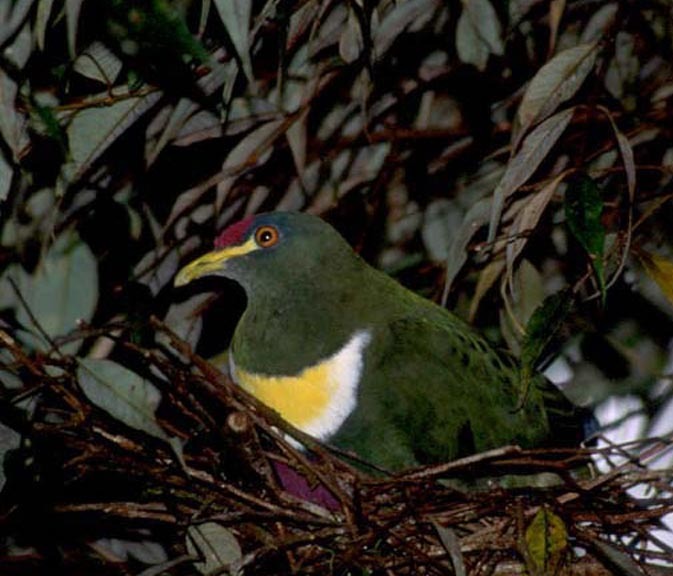 Vocal trait evolution in geographic leapfrog pattern: speciation in the Maroon-chinned Fruit-Dove (Ptilinopus subgularis) complex from Wallacea. Wilson J. Ornithol. 123: 429-440. Romagosa, C.M., and T. McEneaney. 1999. Eurasian Collared-Dove in North America and the Caribbean. N. Am. Birds 53: 348-353. Shapiro, B., D. Sibthorpe, A. Rambaut, J. Austin, G.M. Wragg, O.R.P. Bininda-Emonds, P.L.M. Lee, and A. Cooper. 2002. Flight of the dodo. Science 295: 1683.